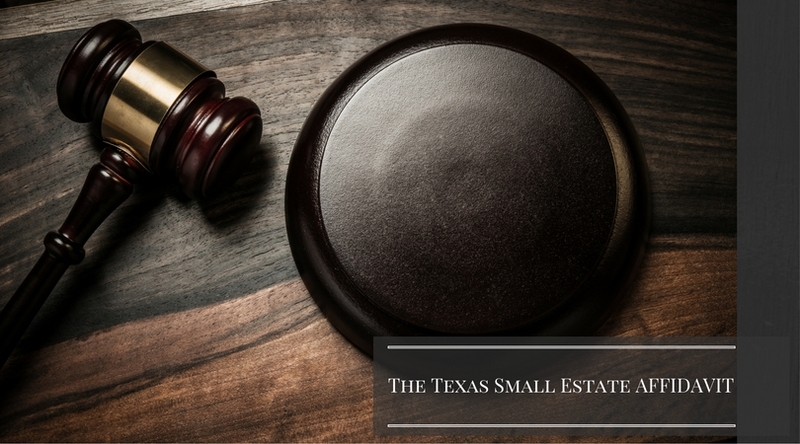 The Texas Small Estate Affidavit - This is not your grandmother’s small estate affidavit any more! - Johnny W. Thomas Law Office, P.C. The Texas Small Estate Affidavit – This is not your grandmother’s small estate affidavit any more! The death of a loved one is never an easy loss to bear. Many times, we are left to make decisions for the care and upkeep of a loved one’s property and legal matters. Unfortunately, many people assume that the property of the deceased automatically passes to family members at the time of death. This is generally not the case. It is important that you speak with an attorney regarding a decedent’s estate and institute the proper probate procedure. A probate proceeding allows a proper heir to rightfully receive the property of a deceased loved one. Probate proceedings can be conducted in the form of Dependent Administration, Independent Administration, and Muniment of Title. In addition, affidavits, such as an Affidavit of Heirship or a Small Estate Affidavit may provide the required remedy for your case. The deciding factors on which procedure to use for the property of your deceased loved one can include, but is not limited to, the existence of a will, value of the decedent’s property, and the cost. You should seek legal advice when making a decision of what procedure to use. In the past, what were the benefits of filing a small estate affidavit in comparison to other probate proceedings? In the past, a small estate affidavit was generally a less costly and simpler option in comparison to other probate procedures. Small estates affidavits were generally used for decedent’s with property value less than $50,000.00. The filing of the affidavits allowed the transfer of the decedent’s property to the surviving family member(s). What changes have been made to small estate affidavit process? Effective January 1, 2015, the Texas Probate Code was substantially reorganized and re-titled as the ‘Estate Code.’ Changes continued into 2015, when HB 3136 was signed into law on June 19, 2015. This House Bill substantially changed the substance and benefit of what is called the Small Estate Affidavit. The changes took effect September 1, 2015. Unlike in the past, a small estate affidavit page length has increased, requiring a more in-depth reporting of the decedent’s estate. The biggest change is that all property claimed as exempt must be listed in the affidavit. Property exemptions allow for the heirs to keep certain property and to “save” the property from being used to satisfy the decedent’s pending debts to his creditors. A property exemption commonly used includes the homestead exemption, which pertains to property the decedent used as a home residence. The application of this exception depends on other qualifying factors. Qualified legal advice can help you navigate these qualifying factors and other law pertaining to property exemptions. Another major change to the Small Estate Affidavit limits transfer to a surviving spouse, minor child, unmarried adult child, an unmarried adult child remaining with the family, or an adult incapacitated child, etc. This change limits the availability of this probate proceeding for most clients. For example, siblings of an unmarried, childless decedent would not be able to file a Small Estate Affidavit to transfer the decedent’s property. In order to probate, the siblings may be forced to file a full probate through Dependent Administration, Independent Administration, or Muniment of Title. If a loved one has recently passed, it is important that you consult with an attorney about the available probate procedures. An attorney can advise you on what procedure is best for you.